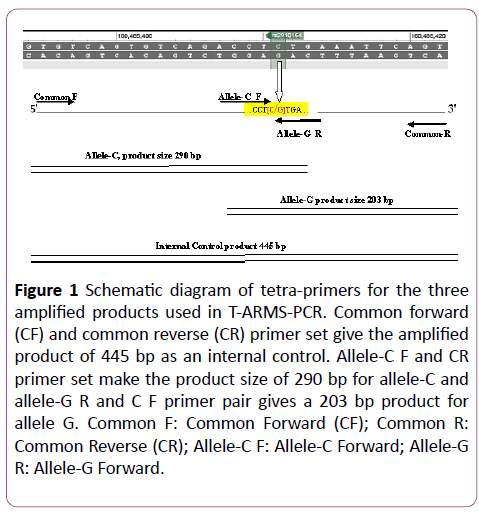 Citation: Afzal M, Rahim A, Naveed AK, Ahmed S, Kiyani MM (2018) Development of Cost-effective Tetra-primer Amplification Refractory Mutation System (T-ARMS) PCR for the Detection of miR-146a gene rs2910164 C/G Polymorphism in Breast Cancer. Biochem Mol Biol J Vol. 4: No. 1: 1. Evaluation of a single nucleotide polymorphism (SNP) and single nucleotide mutation in cancer patients and other diseases is crucial for genotypic characterization in order to select therapy and genetic counseling. The study aim is to develop and optimization for the detection of miR-146a gene rs2910164 C/G polymorphism in breast cancer. Tetra-primer Amplification Refractory Mutation System (T-ARMS) PCR was applied on 60 individuals to determine the genotype and allele frequencies. Genotype frequencies of miR-146a gene rs2910164 C/G polymorphism were homozygous CC 65%; heterozygous CG 6.65%; homozygous GG 28.35%; allele C and G frequencies were 68.5% and 31.5% respectively. These were in Hardy–Weinberg’s equilibrium; p=0.18. Our study provides a simple rapid and a cost-effective T-ARMS-PCR molecular technique that could be used for the detection allele specific DNA polymorphisms and mutations in certain diseases and normal population at large scale. Breast cancer is one of the leading cause of death among women world over and the second most common malignancy after lung cancer . Multifarious patho-physiology of breast cancer as both environmental and genetic factors is involved in its causation. Nowadays its early detection options have improved thanks to the latest technology many new innovative techniques have been developed but still need to develop the low cost methods that could be applied in developing countries. Single nucleotide polymorphisms (SNP) of microRNAs (miRNA) genes involved in cell cycle  that express the products in the form of microRNAs and proteins that bind to their corresponding 3’untranslated region of target mRNAs  to regulate are extremely crucial for both normal and abnormal biological processes . The polymorphism as homozygous or heterozygous of miRNA genes may lead to the causation of cancer, metastasis and drug resistance . At the DNA level 99.5% of it is identical in the general population, only 1% of single nucleotide polymorphism is present within the population an if these SNPs present in the coding region of genes, they can disrupt the structure and functions of proteins that can result the onset of disease processes . Genotyping techniques are all based on the principles of a few basic technologies such as PCR-based methods, hybridization technologies, fragment length polymorphism analysis and Sequencing. The issues associated with these genotyping techniques are time consuming and costly . Newton et al. in 1989  and Shu et al. modified the PCR to detect the wild and mutant alleles . Thus, the method employed to detect allele specific products should be trust worthy, which can detect large number of samples fast enough with minimal of cost. In our present study, we investigated SNP rs2910164 (C/G) of miR-146a gene on human chromosome 5q33.3 which is associated with different types of cancers including breast cancer [10,11]. Different studies so far conducted have shown susceptibility of this polymorphism to cancer and other studies have refuted the findings of any type of association of this SNP with cancers like breast, bladder and kidney in Asian and white people . In this pilot study tetra-primer T-ARMS-PCR was developed and optimized the protocol for amplification of both alleles in a single reaction to conclude the sample as homozygous or heterozygous simultaneously. Then it was carried out in case control study to evaluate the clinical role ofmiR146a rs2910164 (C/G) genotype and allele frequencies in the susceptible and diagnosed breast cancer as a risk marker [13-16]. Control sample of 60 individuals collected for the case control study were used for the pilot project. The study was approved by the institutional Ethical Review Committee (ERC) of medical faculty Riphah International University-Islamabad Pakistan (ref# Riphah/IIMC/ERC/16/016). The consent, study protocol quaternary forms were approved by institutional ERC. The study was conducted at Multidisciplinary Research Lab, Islamic International Medical College, Riphah International University-Pakistan in collaboration with Genetics Resource Centre. Written informed consent was obtained from every individual before drawing the blood with the respective institutional permission (ref # 12655). Genomic DNA was isolated from the blood samples according to standard chelex method and the extracted DNA was stored at -20°C before amplification. The quantification and purity of extracted DNA samples was done by measuring the absorbance at 260 nm and 280 nm (A260/A280) on NanoDrop2000c spectrophotometer (Thermo Fisher Scientific). Allele specific primers with different lengths were designed manually and checked by BLAST tool- NCBI. Amplified DNA fragments for genotypes CC (allele-C) and GG (allele-G) are 290 bp; 203 bp and internal control 445 bp that can be easily separated by 6% poly acrylamide gel electrophoresis (PAGE). The complete contents of single nucleotide polymorphism 2910164 are available at the public website: http:// www.ncbi.nlm.nih.gov/ SNPCATGGGTTGTGTCAGTGTCAGACCT[C/ G]TGAAATTCAGTTCTTCAGCTGGGAT Chromosome: 5:160485411; Gene: MIR146A HGVS: NC_000005.10:g. 160485411C>G (Figure 1). The sequences of the primers are given in the Table 1. Figure 1: Schematic diagram of tetra-primers for the three amplified products used in T-ARMS-PCR. Common forward (CF) and common reverse (CR) primer set give the amplified product of 445 bp as an internal control. Allele-C F and CR primer set make the product size of 290 bp for allele-C and allele-G R and C F primer pair gives a 203 bp product for allele G. Common F: Common Forward (CF); Common R: Common Reverse (CR); Allele-C F: Allele-C Forward; Allele-G R: Allele-G Forward. Table 1: Sequences of primers. Genotype for SNP miR-146a rs2910164 C/G was amplified by T-ARMS PCR in a thermal cycler (major sciences USA). The PCR reaction mixture of 25 ul in a 0.2 ml PCR tube containing 1 ul approximately 100 ng/ul of DNA template, master mix (12.5 mM MgCl2) 4 μl (5X FIREPol (R) Master Mix- Solis BioDyne), 1 ul primer mix (each primer of 10 pmol/ul) and upto 19 ul water (PCR grade). PCR reaction was run according to the following conditions; holding time 95°C for 5 min, followed by 30 cycles of denaturation at 95°C for 30 sec, annealing at 58°C for 30 sec, extension at 72°C for 30 sec and final extension at 72°C for 10 minutes. The amplified products of each reaction were separated on 6% PAGE stained by 0.1% silver nitrate to visualize the bands. miR-146a rs2910164 C/G polymorphism of 60 control samples was done for genotypic and allelic frequencies are shown in the Table 2. Genotype frequencies were 65% for CC, 6.65% for GC and 28.35% for GG respectively. Allele frequencies were 68.35% and 31.65% for C and G respectively, and these were in Hardy–Weinberg’s equilibrium (p=0.18). Findings of genetic variations of miR-146a rs2910164 polymorphism on specific locus of chromosome: 5:160485411 by allele specific T-ARMS-PCR containing the four primers (two alleles specific and two common primers) in a single PCR-tube for one sample. Table 2: Genotype and allele frequency of miR-146ars2910164 (C/G polymorphism). Primer pair of allele-C (forward) and common reverse primers amplify the allele C and; primer pair allele-G (reverse) and common forward amplify the allele G that showed the heterozygous sample (heterozygous CG genotype). The three bands for alleles C, G and common internal control (amplified fragment of common forward and common reverse) were visualized on PAGE on a single lane. In homozygous GG genotype pattern allele-G (reverse) and common forward amplify the product of allele-G and common fragment resulted two bands appeared in Figure 2. Primers set of allele-C (forward) and common reverse amplify the allele C and; common forward and common reverse generated the allele C and control DNA fragments showing the two bands in Figure 3. 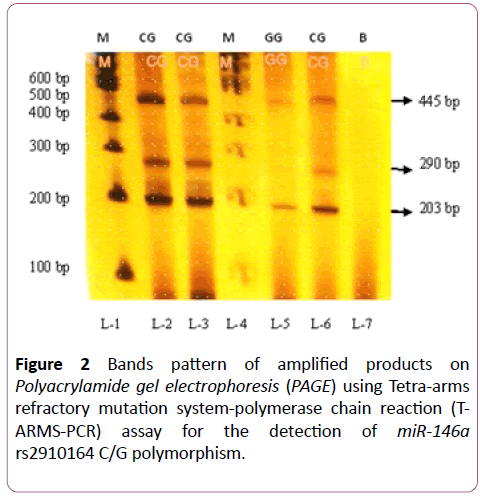 Figure 2: Bands pattern of amplified products on Polyacrylamide gel electrophoresis (PAGE) using Tetra-arms refractory mutation system-polymerase chain reaction (TARMS- PCR) assay for the detection of miR-146a rs2910164 C/G polymorphism. 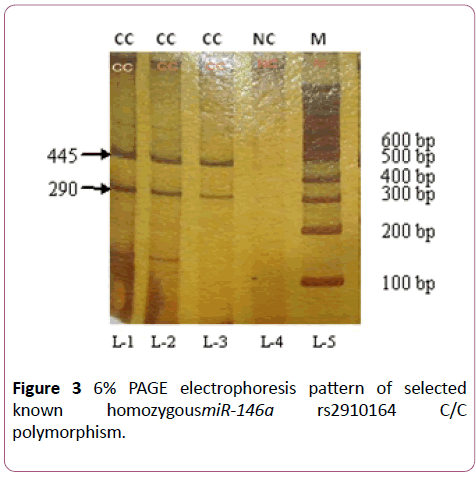 Figure 3: 6% PAGE electrophoresis pattern of selected known homozygousmiR-146a rs2910164 C/C polymorphism. Different technologies like probe based microarray, real, direct sequencing, restriction fragment length polymorphism (RFLP) cleavage enzyme based methods  for single nucleotide polymorphisms (SNPs) or mutations and multiple genotypes identification by MALDI-TOF mass-spectrometry [14,15] that are expensive, time consuming, laborious and sophisticated instruments required. In addition expensive chemicals, equipments and difficult multi-step operation of post-PCR are needed. Conventionally, allele specific PCR method had been developed for detection of SNPs or point mutations in order to demonstrate the genotypes in separate PCR-tubes  and real-time PCR can be used which is quite costly . In our study, we develop the cheap T-ARMS-PCR method for miR 146a gene rs2910164 C/G polymorphism to find the zygosity as homozygous/heterozygous in a single PCR reaction containing manually designed four primers two allele specific and two common that ultimate reduces the expenses, additional special chemical, labor, contamination and missloading the allele of one sample with other. The unique feature of tetra-primers set is to make the DNA fragment resulted by the amplification by common forward and common reverse pair in each PCR-reaction that could be used as a internal procedural control and to confirm the genotype by sequencing. The primer designing strategy of pilot study and optimization of T-ARMS-PCR then applied for case control study in breast cancer susceptible genes. The newly developed optimized allele specific T-ARMS-PCR is the simplest, less-time consuming and cost-effective method in a single PCR-tube for detection of both alleles simultaneously that could be used for the measurement of alleles and genotype polymorphisms at a particular gene locus in order to diagnose and evaluate the treatment response in multi-factorial diseases in different ethnicity populations. We are highly thankful to Dr. Suhaib Ahmed, PhD Molecular biologist provided guidance and technical support at his Genetics Resource Centre to conduct some assays. Dr. Hafsa Aziz, Senior Scientist at NORI Hospital Islamabad provided help in sampling and technical support. The study was conducted with the support of seed money grant reference # F.NO.31/ORIC-RARE/R&T/2015-16/ AKNAVEED provided by research department, Riphah International University, Islamabad-Pakistan. Slaby O, Bienertova‐Vasku J, Svoboda M, Vyzula R (2012) Genetic polymorphisms and microRNAs: New direction in molecular epidemiology of solid cancer. J Cell Mol Med 16:8-21. Iorio MV, Casalini P, Piovan C, Braccioli L, Tagliabue E (2011) Breast cancer and microRNAs: Therapeutic impact. The Breast 20: S63-S70. Baffa R, Fassan M, Volinia S, O'hara B, Liu CG, et al. (2009) MicroRNA expression profiling of human metastatic cancers identifies cancer gene targets. J Pathol 219: 214-221. Matamala N, Vargas MT, González-Cámpora R, Miñambres R, Arias JI, et al. (2015) Tumor microRNA expression profiling identifies circulating microRNAs for early breast cancer detection. Clinical Chem 61: 1098-1106. Shastry BS (2007) SNPs in disease gene mapping, medicinal drug development and evolution. J Human Genet 52:871-880. Ranjha R, Meena NK, Singh A, Ahuja V, Paul J (2017) Association of miR-196a-2 and miR-499 variants with ulcerative colitis and their correlation with expression of respective miRNAs. PloS one 12: e0173447. Popa OM, Bojincã M, Bojincã V, Ciofu C, Bârã C, et al. (2009) Introduction to SNP genotyping by Real-Time PCR. Travaux du museum National d’Histoire Naturelle Grigore Antipa 52: 515-522. Ye S, Dhillon S, Ke X, Collins AR, Day IN (2001) An efficient procedure for genotyping single nucleotide polymorphisms. Nucleic Acids Res 29: e88. Newton C, Graham A, Heptinstall L, Powell S, Summers C, et al. (1989) Analysis of any point mutation in DNA. The amplification refractory mutation system (ARMS). Nucleic Acids Res 17: 2503-2516. He F, Liu B, Meng Q, Sun Y, Wang W, et al. (2016) Modulation of miR-146a/complement factor H-mediated inflammatory responses in a rat model of temporal lobe epilepsy. Biosci Reports 36: e00433. Shen J, Ambrosone CB, DiCioccio RA, Odunsi K, Lele SB, et al. (2008) A functional polymorphism in the miR-146a gene and age of familial breast/ovarian cancer diagnosis. Carcinogenesis 29: 1963-1966. Starczynowski DT, Kuchenbauer F, Argiropoulos B, Sung S, Morin R, et al. (2010) Identification of miR-145 and miR-146a as mediators of the 5q-syndrome phenotype. Nature Med 16: 49-58. Kwok PY, Chen X (2003) Detection of single nucleotide polymorphisms Curr Issues Mol Biol 5: 43-60. Millis MP (2011) Medium-throughput SNP genotyping using mass spectrometry: multiplex SNP genotyping using the iPLEX® Gold assay. Disease Gene Identification: Methods and Protocols. pp. 61-76. Fan AXC, Garritsen HS, Tarhouny SE, Morris M, Hahn S, et al. (2008) A rapid and accurate approach to identify single nucleotide polymorphisms of mitochondrial DNA using MALDI-TOF mass spectrometry. Clinical Chem Lab Med 46: 299-305. Lang AH, Drexel H, Geller-Rhomberg S (2011) Optimized allele-specific real-time PCR assays for the detection of common mutations in KRAS and BRAF. J Molecular Diagnos 13: 23-28.